I was pleasantly surprised by this movie. It was not the best film ever made but all in all it was not bad. It starts off with three teachers who are on their way to a Dodger game. They have car trouble and stop in front of a service station in a deserted desert town. As one of the teachers, Ed, starts working on the car the other two, Carl and Doris, try to find the people who own the station. It seems that the station is deserted and they are alone. However, Charlie and his girlfriend Judy appear from behind some of the cars and they have a gun. Charlie tells them that they need to fix the car so they can escape. It seems that they have been on a killing spree from Arizona and the teachers are next. He begins to play a game of cat and mouse with them just to torture them before he kills them. However, they have a plan to escape - but will it work? This movie was pretty scary. It is loosely based on the famous Starkweather/Fugate killings of the 1950s. 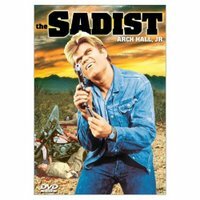 Arch Hall, Jr (who I had never heard of) was excellent as the sadist Charlie. Marilyn Manning is also brilliant as Judy, who has no real lines but whispers horrible deeds in Charlie's ear and giggles. Two of the creepiest performances I have seen. If you like suspense movies this is a must see.